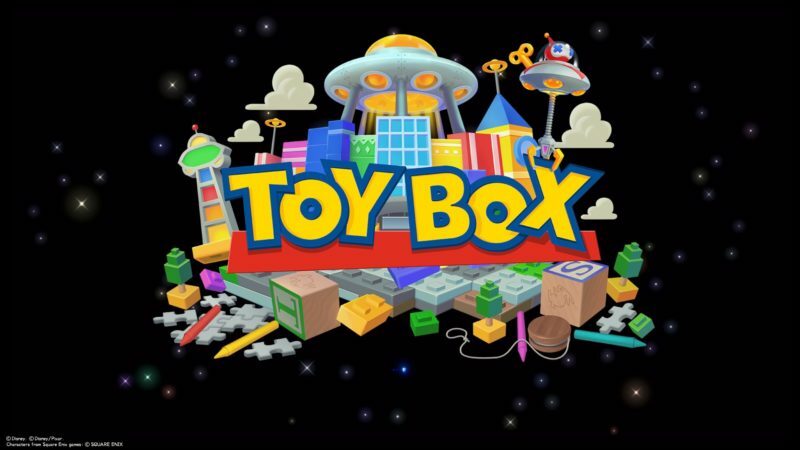 Toy Box may be the third world you will be visiting in Kingdom Hearts 3 and it’s related to Toy Story. 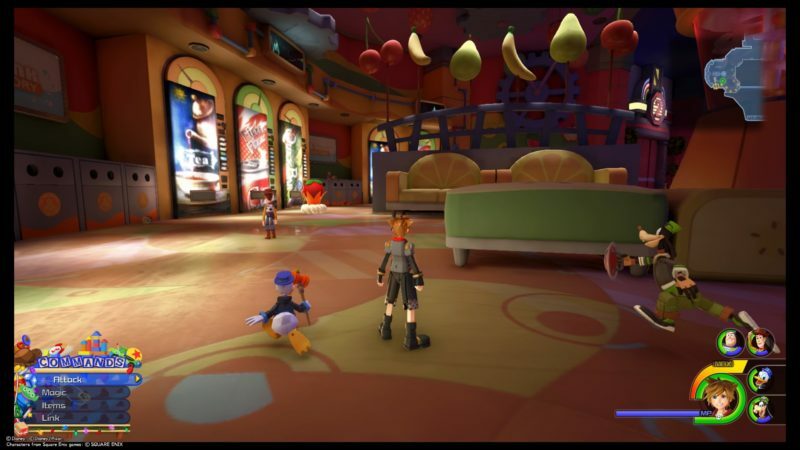 The recommended level is 12 if not mistaken and this time, Sora and the gang will be transformed into toy lookalikes. 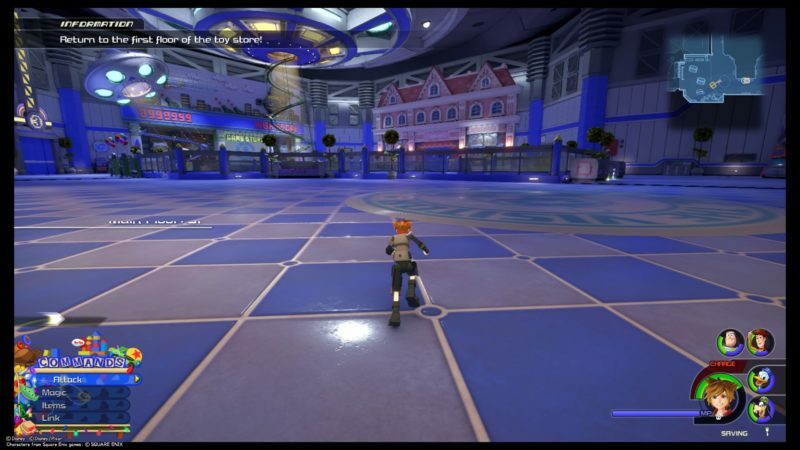 Here’s a walkthrough and guide of Toy Box in KH3. Before entering this world, you may have encountered a robot Heartless (Astro) in the Oceans Between. Just defeat it and you should be able to enter this world. The first thing you have to do is go straight into battle. 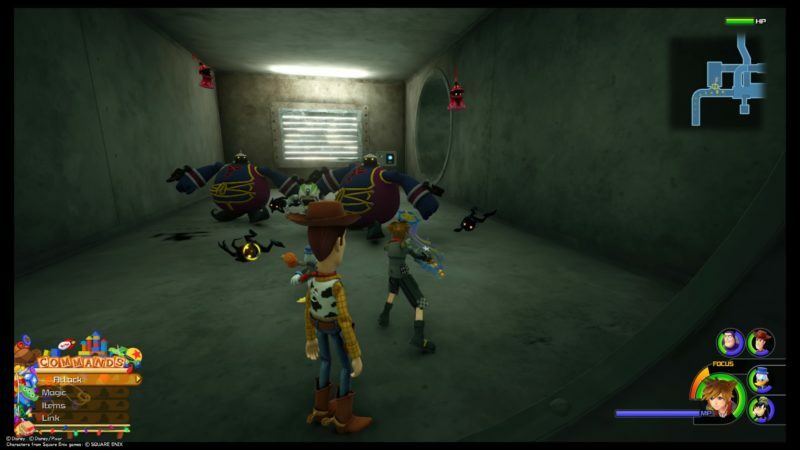 Defeat the Heartless that spawned in Andy’s room. 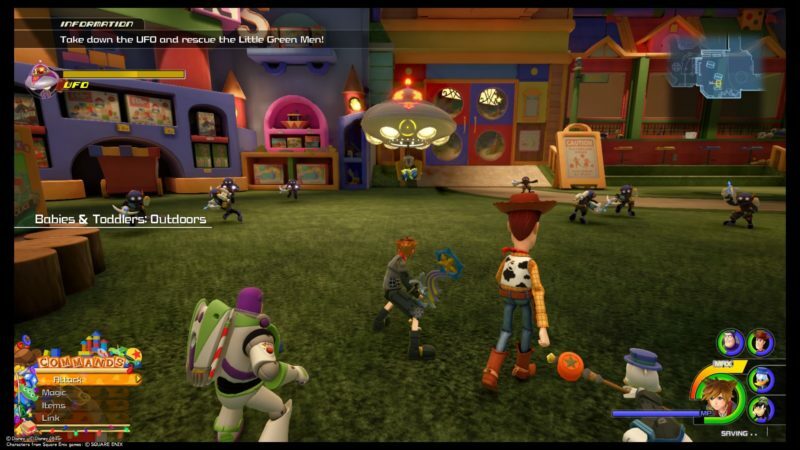 After the battle, you guys will meet up with Buzz Lightyear, Woody, Rex, Hamm, the aliens and the toy soldiers. 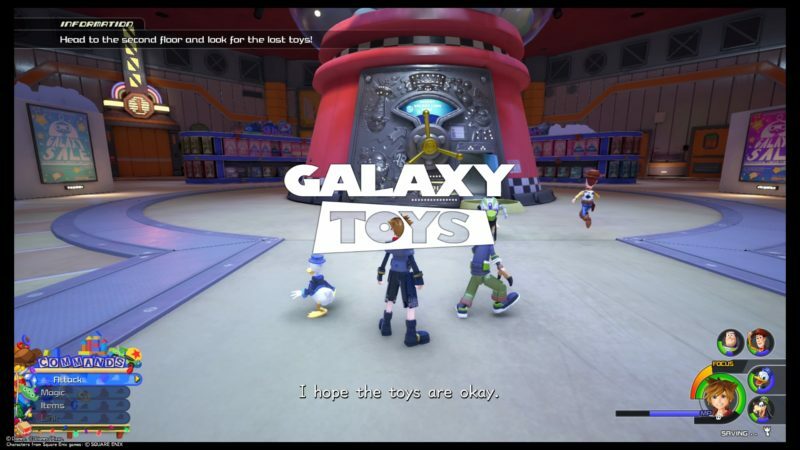 Your next objective is to get to Galaxy Toys. 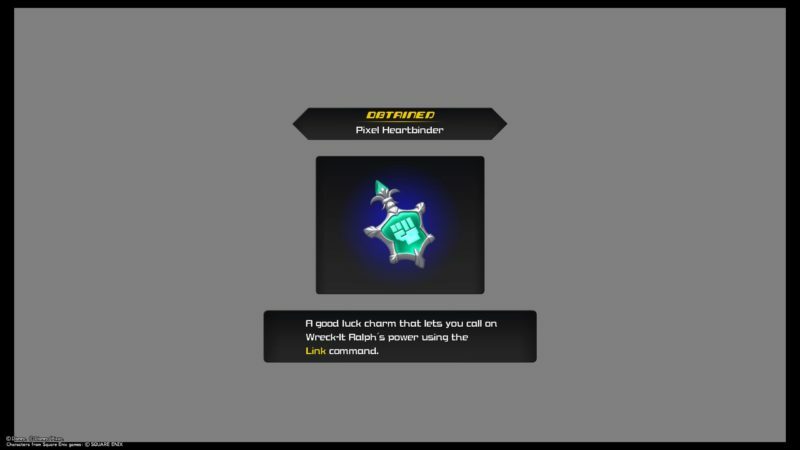 Before that, remember to loot the chests and take photos of the lucky emblems in the room. 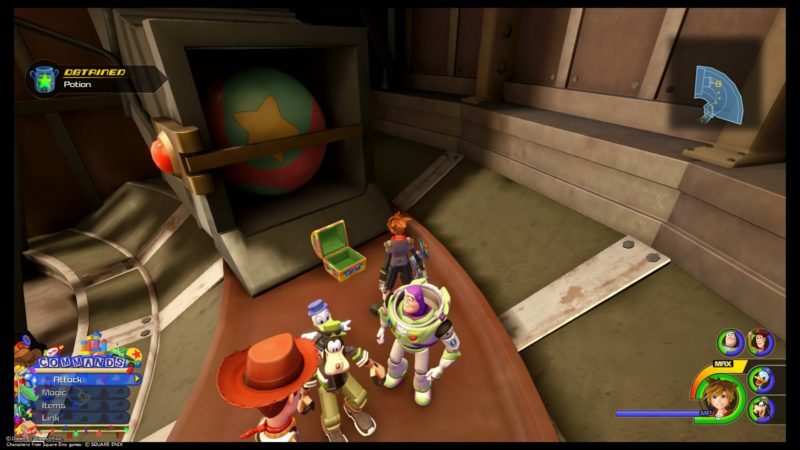 You will also find a map of Andy’s house inside a treasure chest. 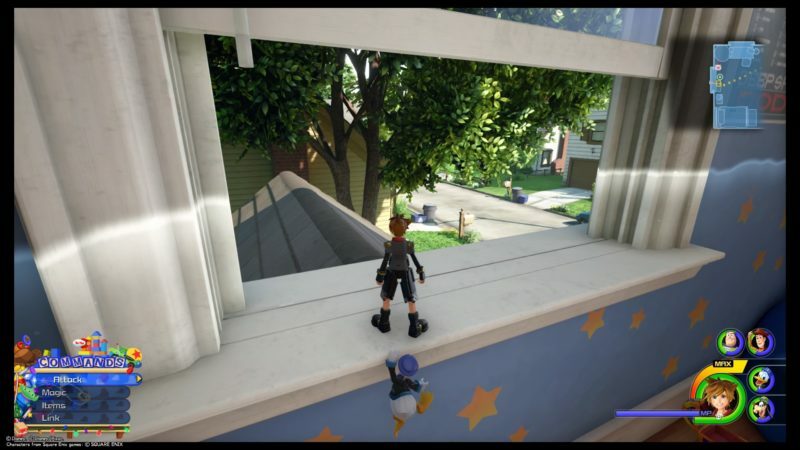 To get to the next area, jump out of the window. 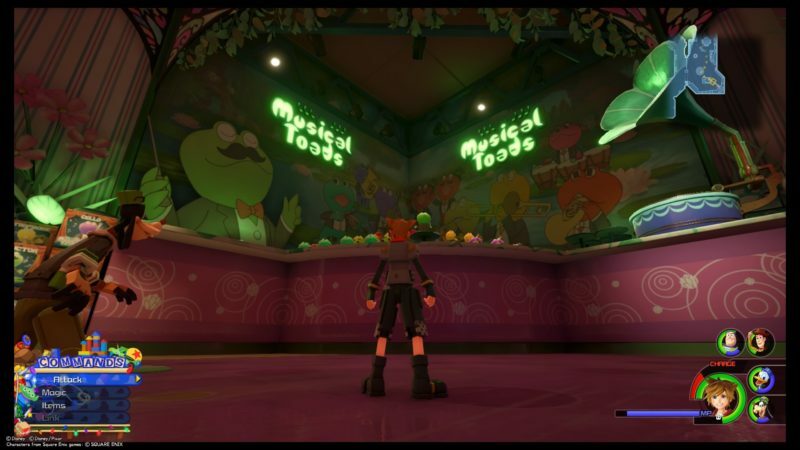 You will encounter even more Heartless here. 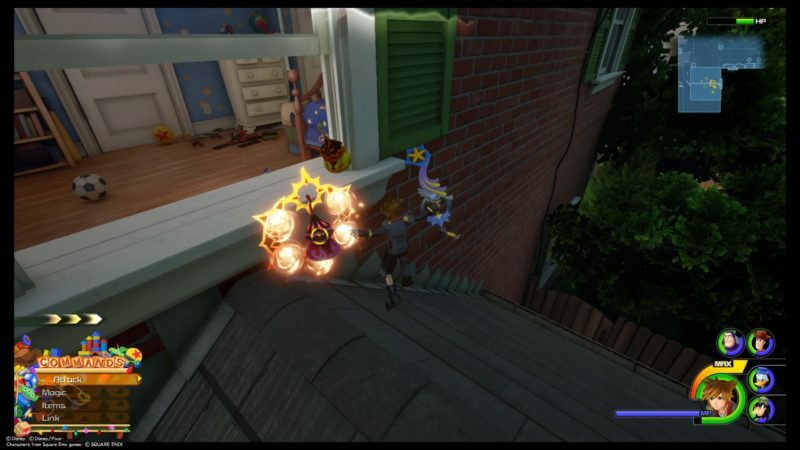 There are also more Lucky Emblems and treasure chests outside the house. 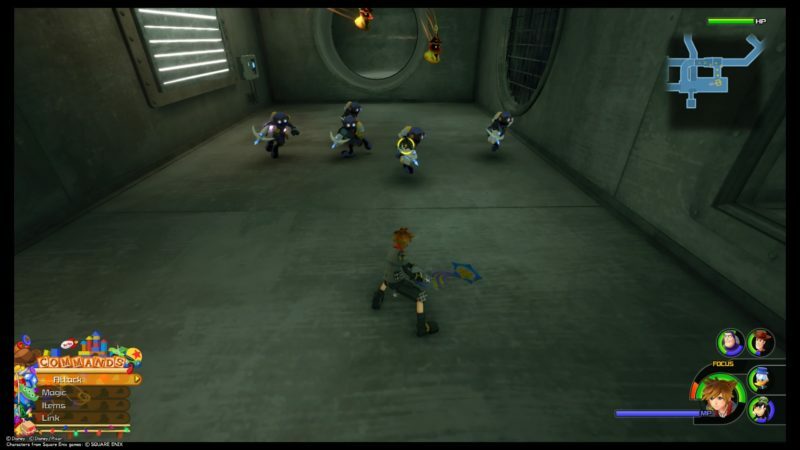 You have quite a big area to roam around, but each spot has a different group of Heartless. There is also a treasure chest at the backyard which gives you an elixir. 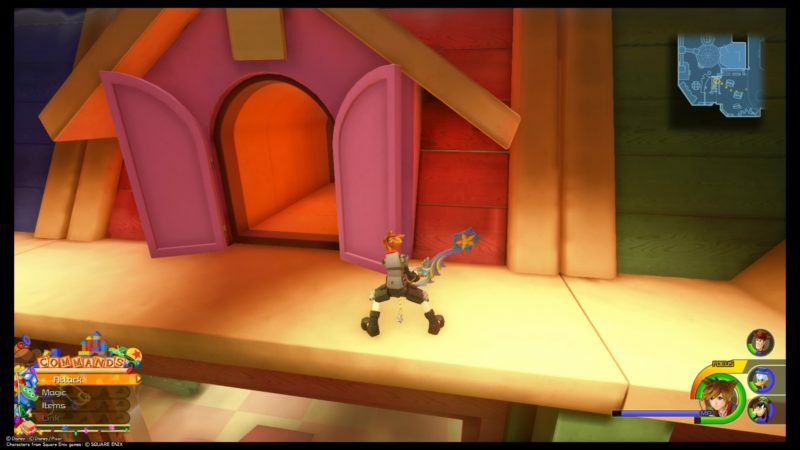 To open the box which leads to the treasure chest, you should jump from a high spot and while gliding, press “X” to attack the box. 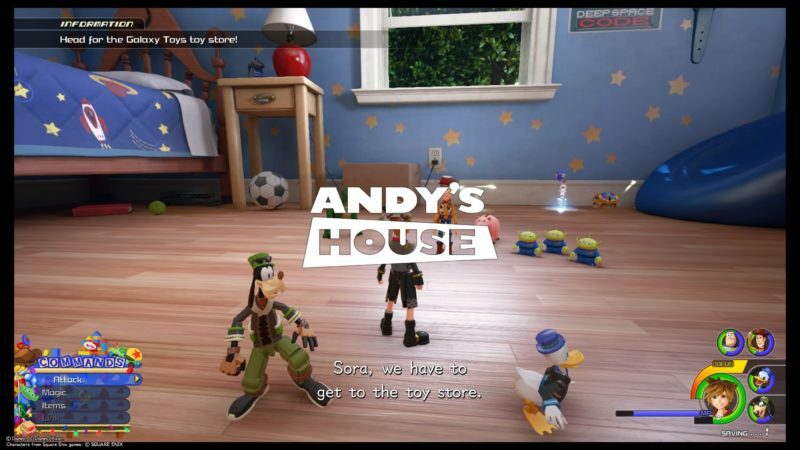 Once you’re done with Andy’s house compound, get around the area to find collectibles and fight Heartless. 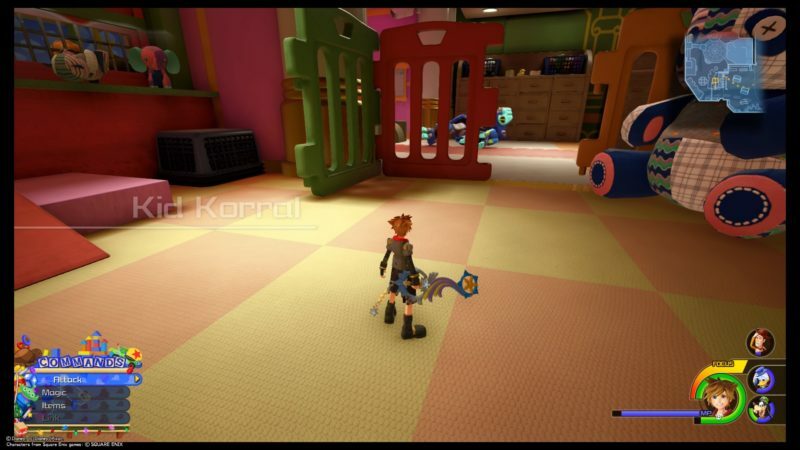 If you leave the map through the “red” border, you will reach Galaxy Toys. 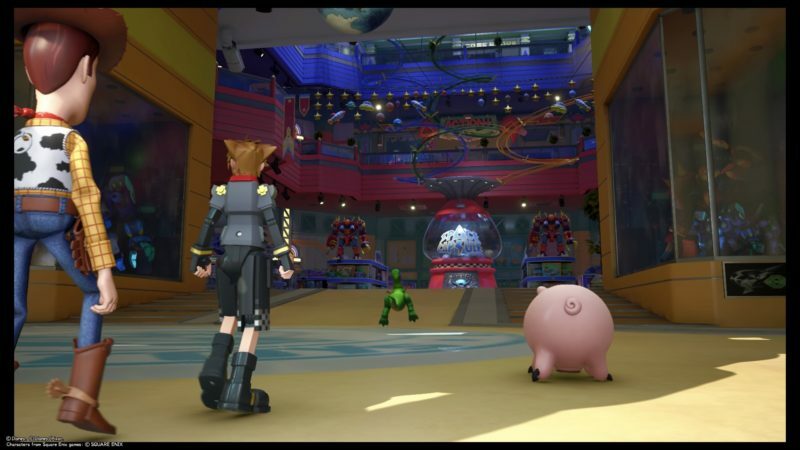 This is the entrance of the huge toy store. You will spend most of your time here. 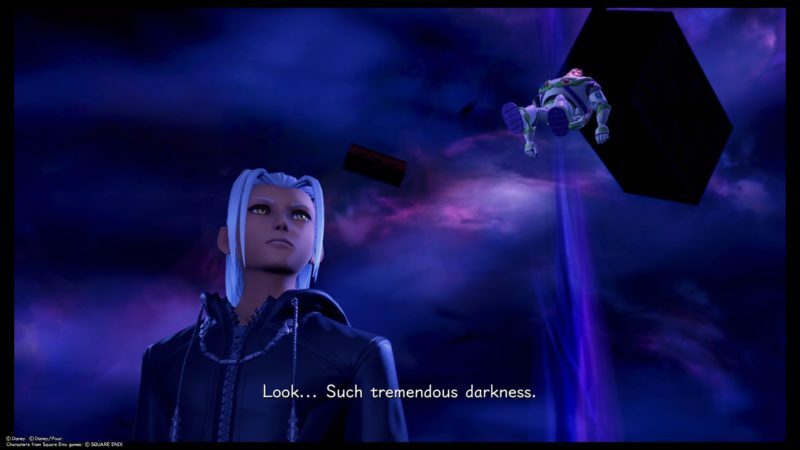 During the cutscene, Xehanort appears to taunt you guys again. 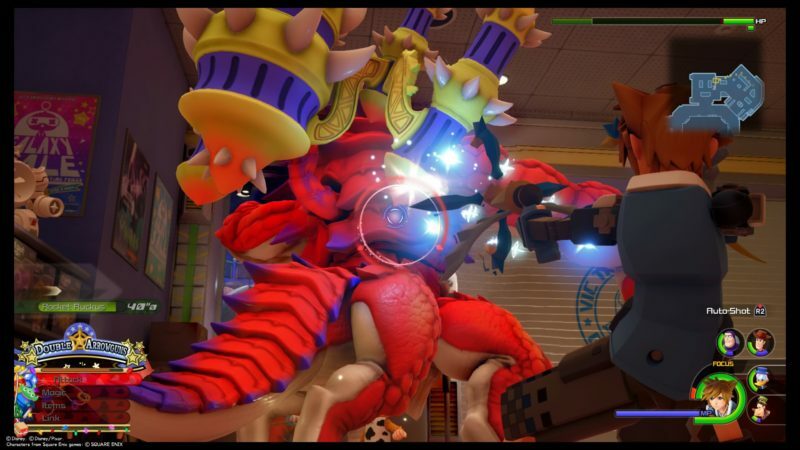 He will summon a couple of Heartless who will then use the Gigas robot toys. 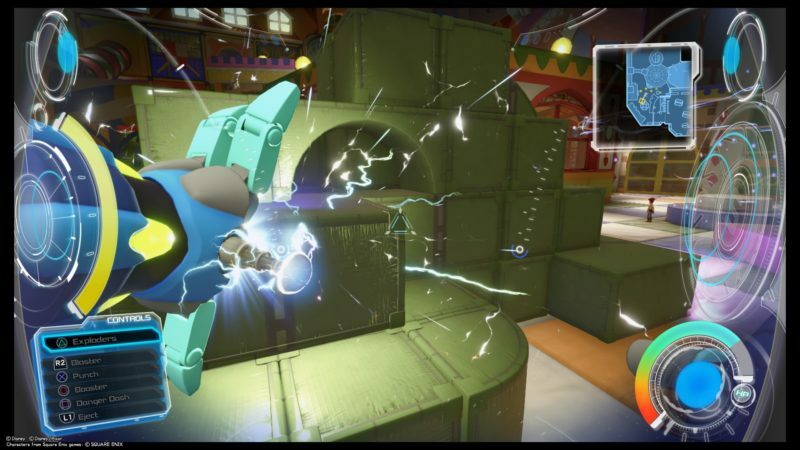 These robots are pretty tough, so you may want to use a robot yourself. 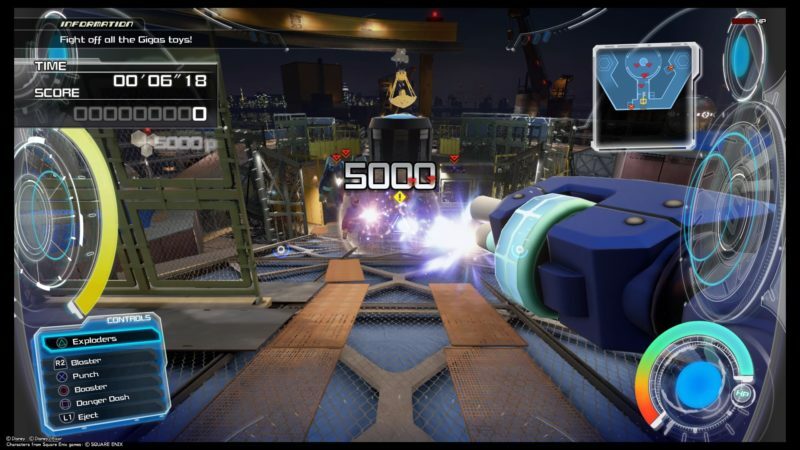 Just airstep over to any of the unused robots and press “Triangle” to control it. As you can see in the screen below, you have all kinds of functions. 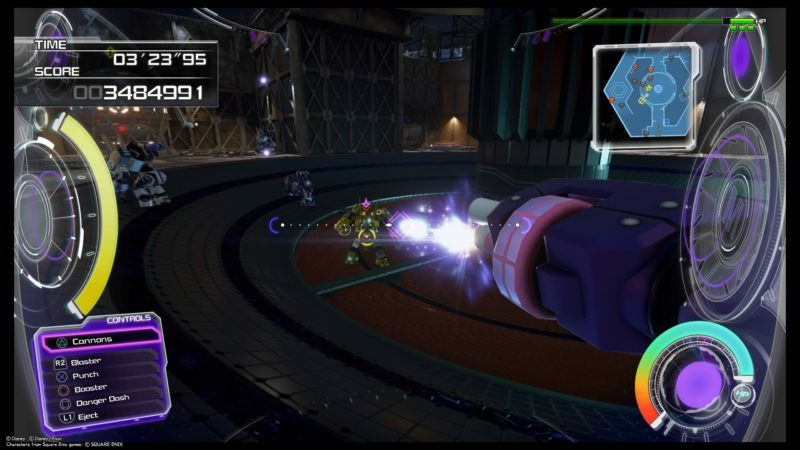 Each robot (red / blue / pink / green) has different special attacks as well. 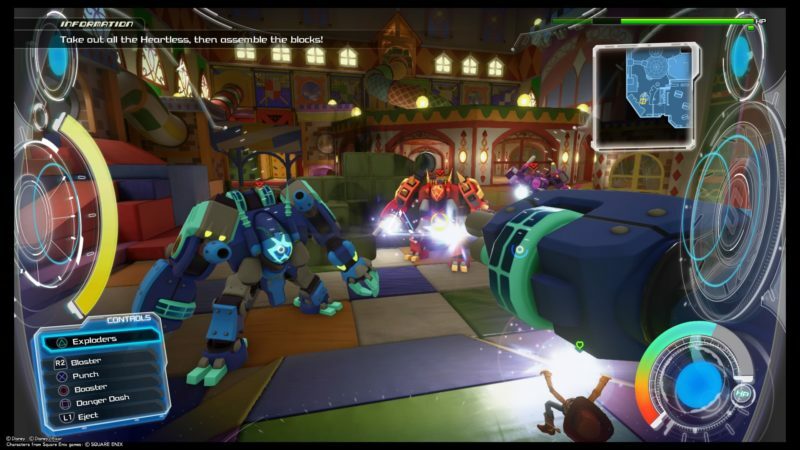 There will be plenty of these Gigas, so take your time to destroy all of them. Personally, I love to use the punching attack. Dashing towards it and punching is a good combination. 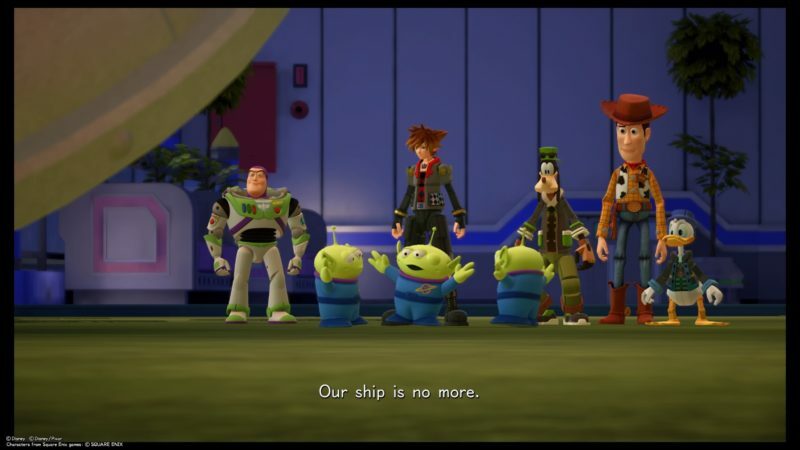 After defeating them, you’ll realize that Rex, Hamm and the alien toys went missing. Now, use the machine in the middle to get to the 2nd floor. 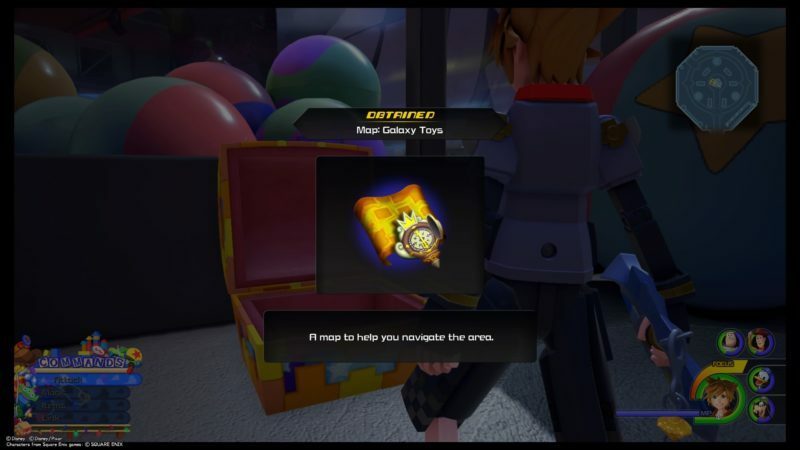 Once you get up, you should find a treasure chest that leads to the map of Galaxy Toys. 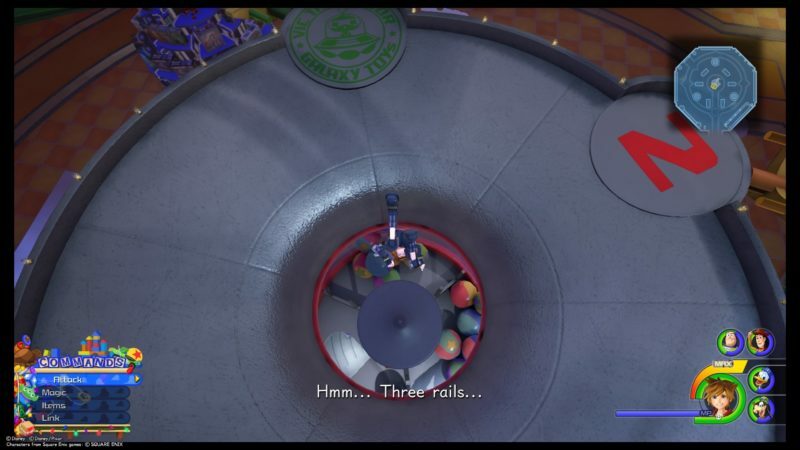 Now, you have three platforms, green, red and blue. 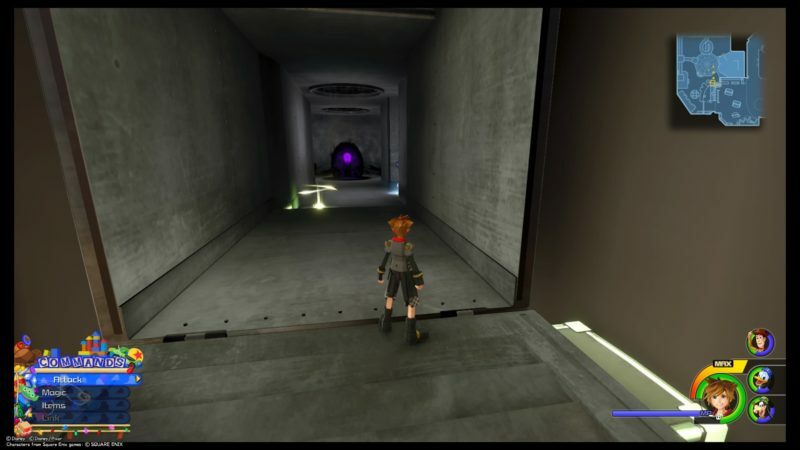 The green one leads to the highest floor, which doesn’t have any Heartless, but there are two treasure chests there. Blue leads to the third floor, and red leads to the second floor. 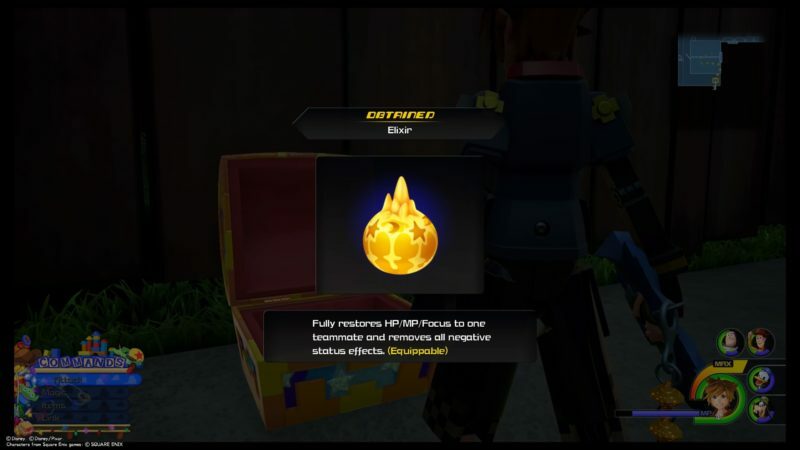 One of the chests will give you a new mini game. The red one leads to the brown / golden pathway to the 2nd floor. 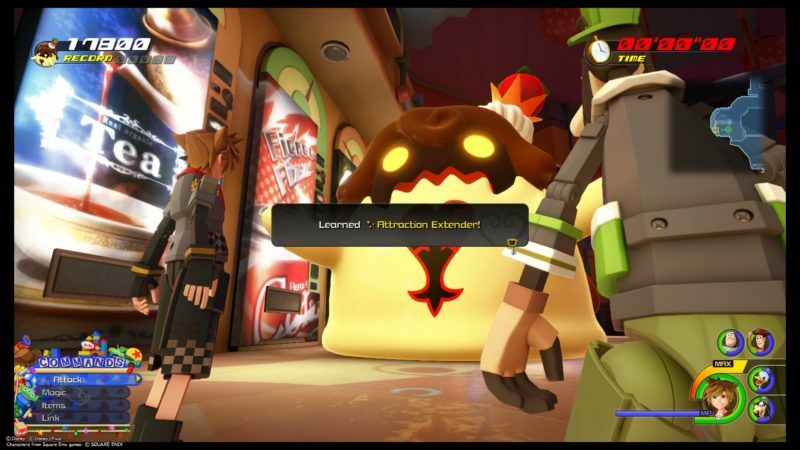 You will meet even more Heartless here, and some of them use Gigas. 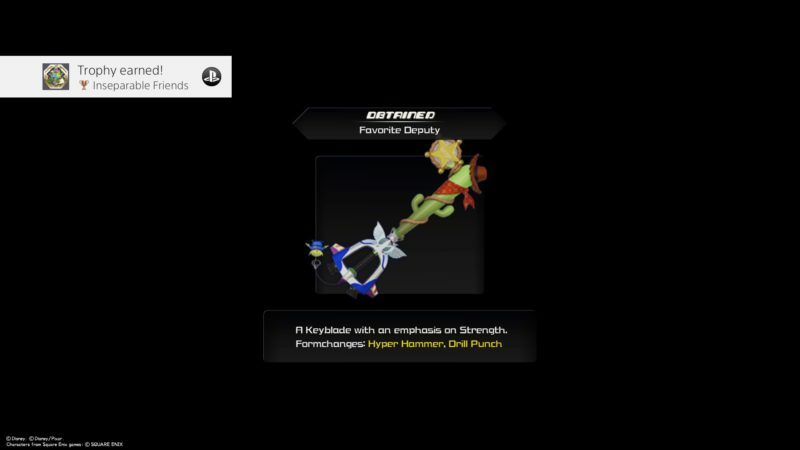 Defeat all of the Heartless. Just a short detour here. There’s a rest room here, where you can play a mini game. 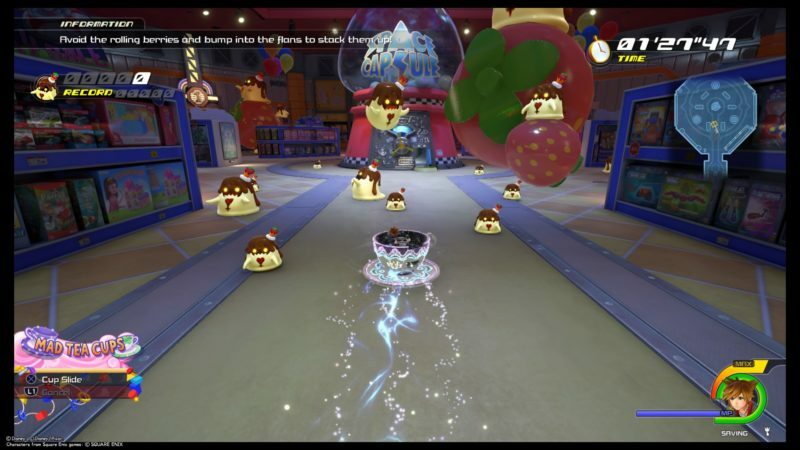 This mini game works by avoiding the berries and collecting flans. Bump into the flans to stack them up. The more you stack the higher you will be. Each time you knock into a berry, you will lose a flan or two. The game ends when the time is up. 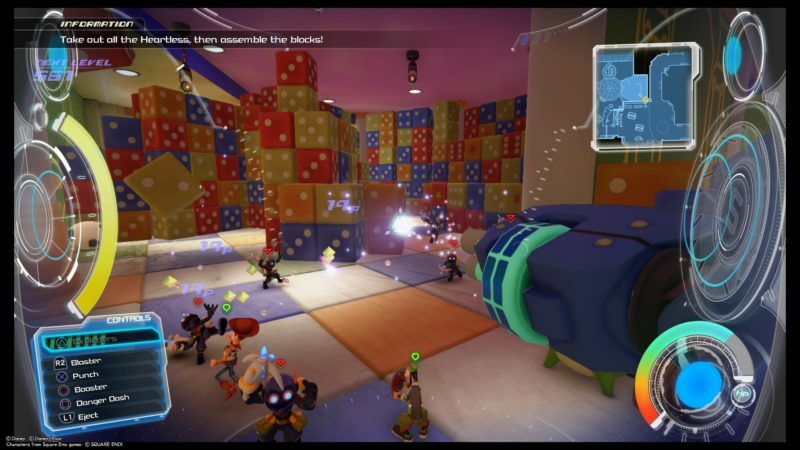 Personally, I learned “Attraction Extender” from this game. 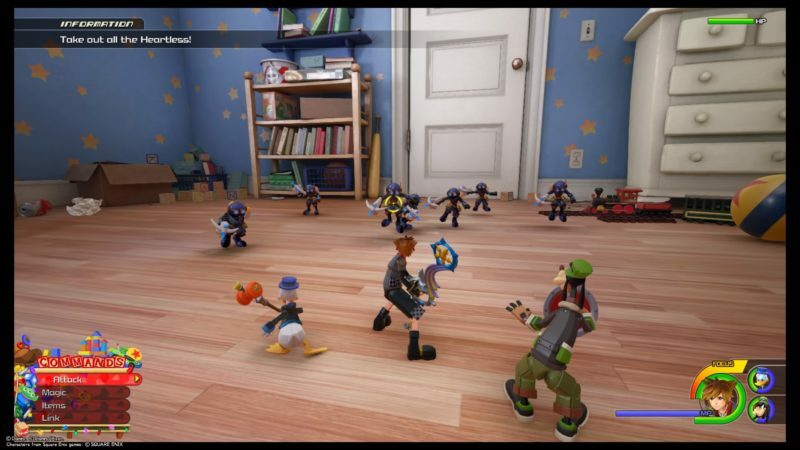 The room you need to go to is the one with action figures. 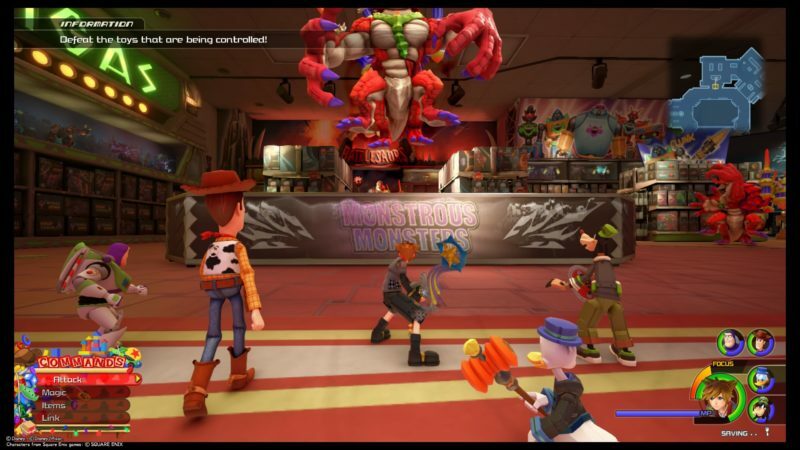 You will be greeted with more Heartless. This time, they’ll be using these red beasts. 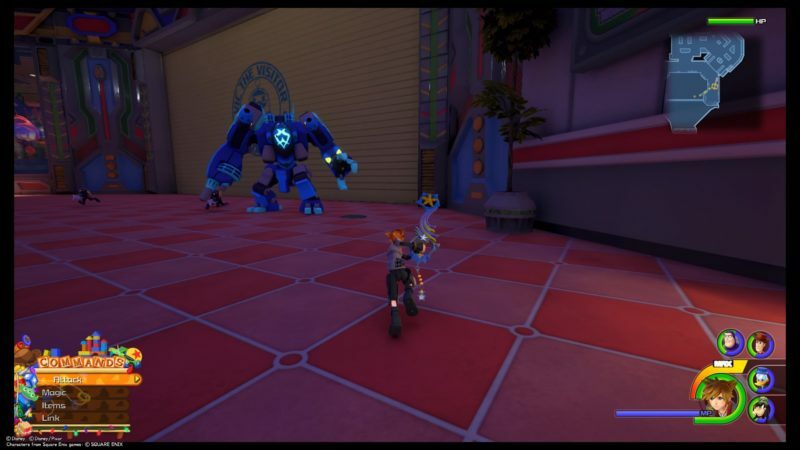 If possible, find a Gigas robot to use. 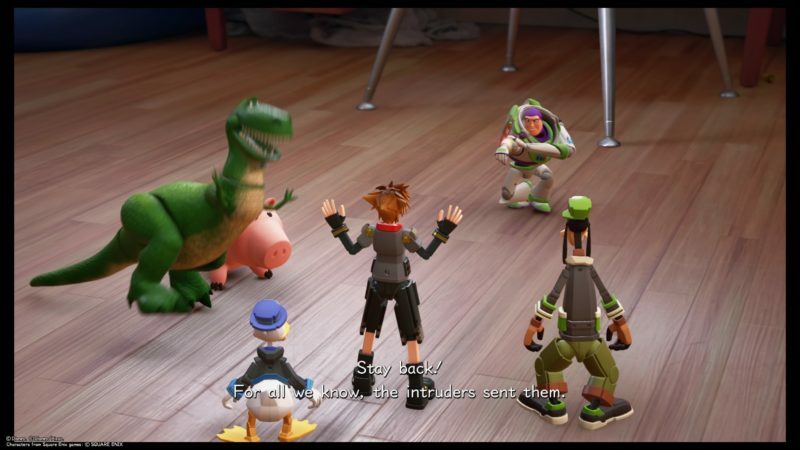 After defeating them, Rex shows up. To rescue the remaining toys, get to the vent. 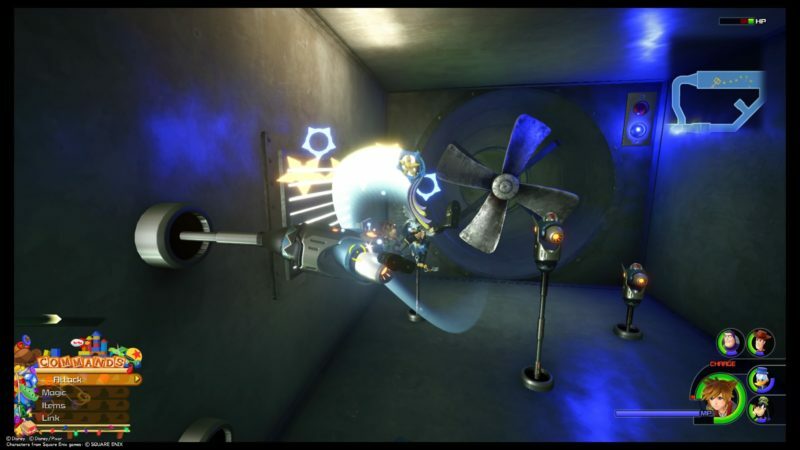 You will find the entrance to the vent on top of the shelf leaning against the wall. 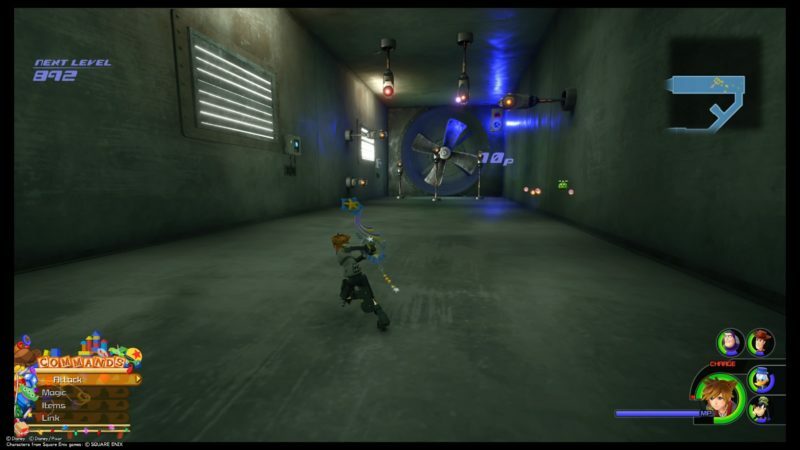 Inside the ventilation system, you will find even more Heartless, a lucky emblem and treasure chests. Keep going until you find this fan. 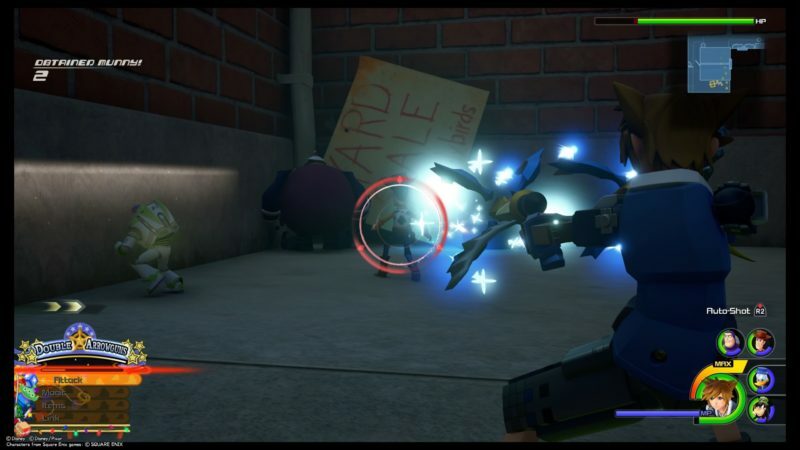 There are plenty of Heartless here as well, mostly fixed to the wall. 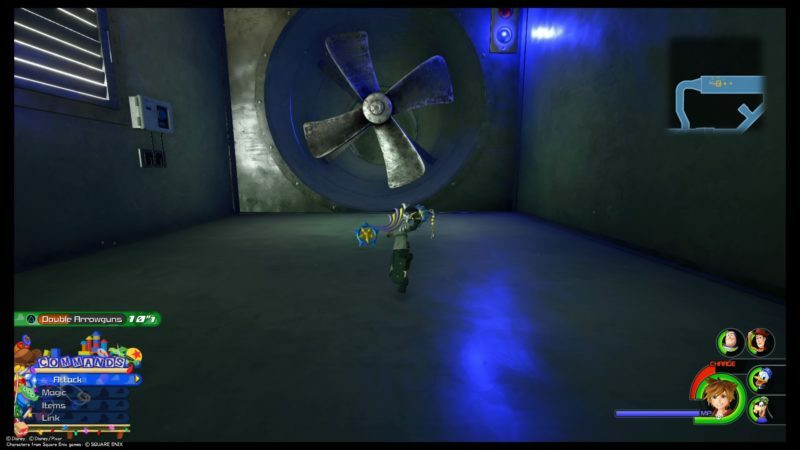 After defeating the Heartless, you need to go through the fan. Wait for it to stop moving, otherwise you’ll get blown away. 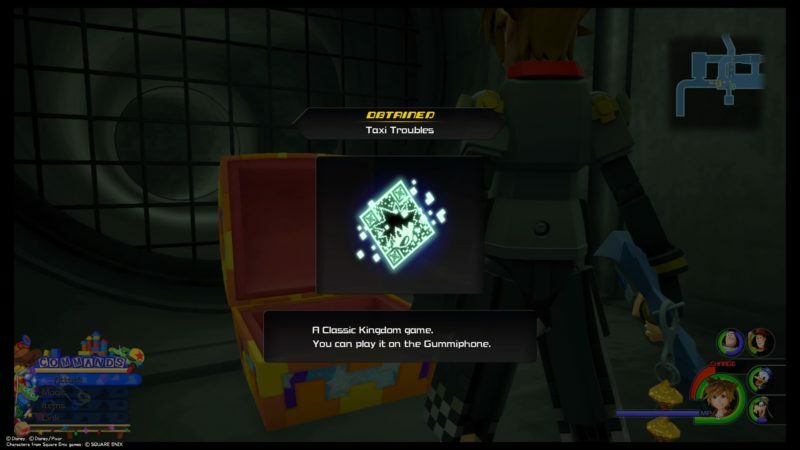 After going through the fan, you will find a treasure chest which gives you another mini game for your Gummiphone. You will then reach the Upper Vents. Keep going until you get to the Baby and Toddler section (image below). 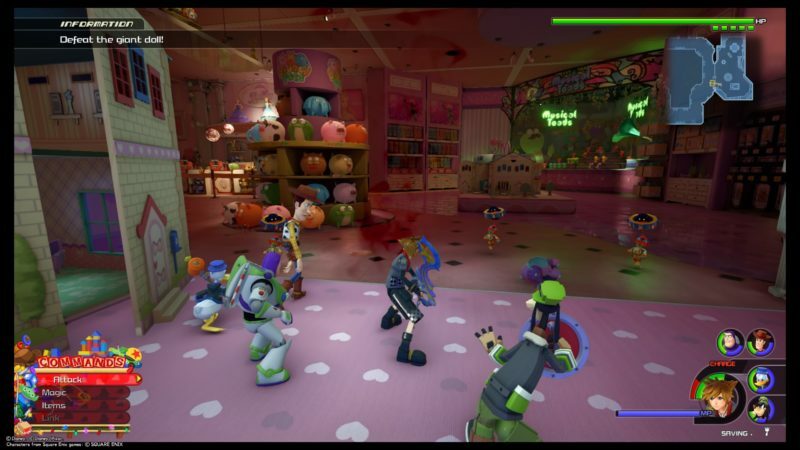 Once again, this room has plenty of Heartless (many in the form of soft toys), a lucky emblem (disco balls) and some treasure chests. Defeat all of the toys. More will spawn as you get deeper into the room. 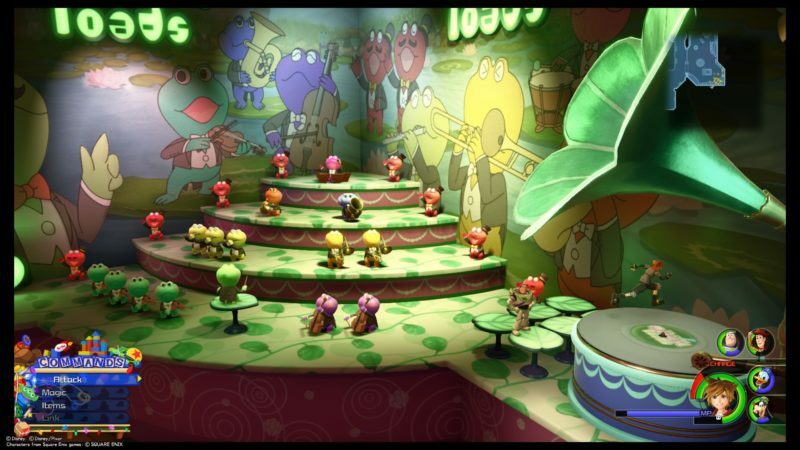 After you’ve defeated all of them, get to the musical toads. They are at the corner in the room. Climb up on it and get to the old record player. You will have to run on it to start the music. Keep going one direction and the music starts playing. 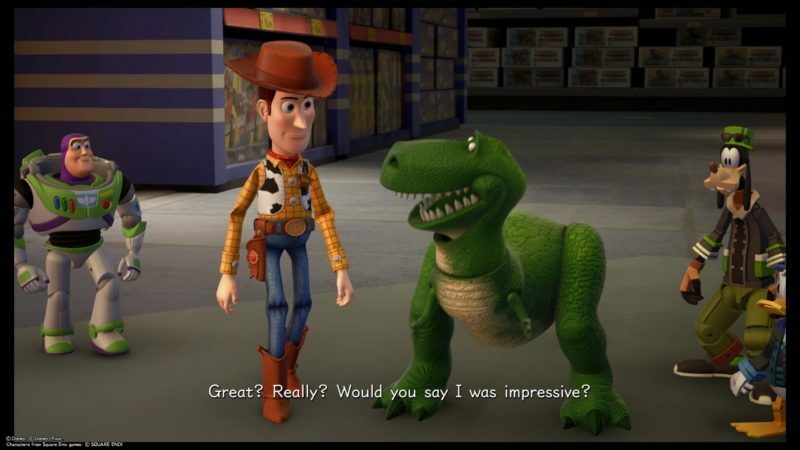 Woody will join you as well. You will then hear that the sound is a little weird. Get to the toad that emits the weird noise. 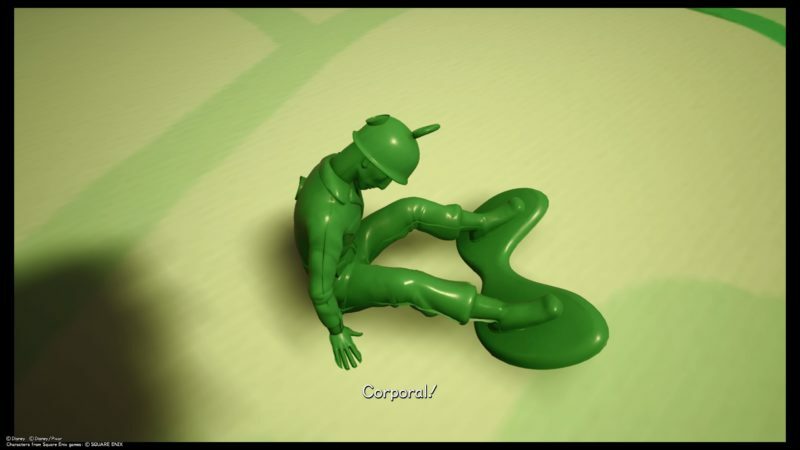 Turns out, one of the toy soldiers was stuffed into the bass saxophone (or whatever that is). 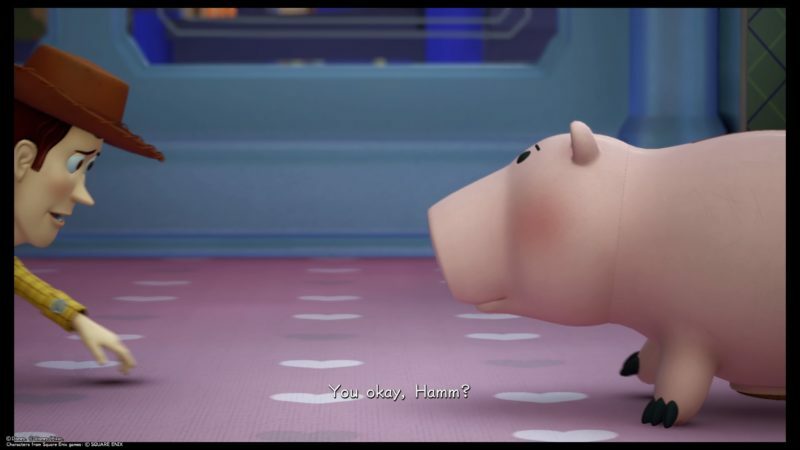 After rescuing the soldier, look for Hamm in the same room. 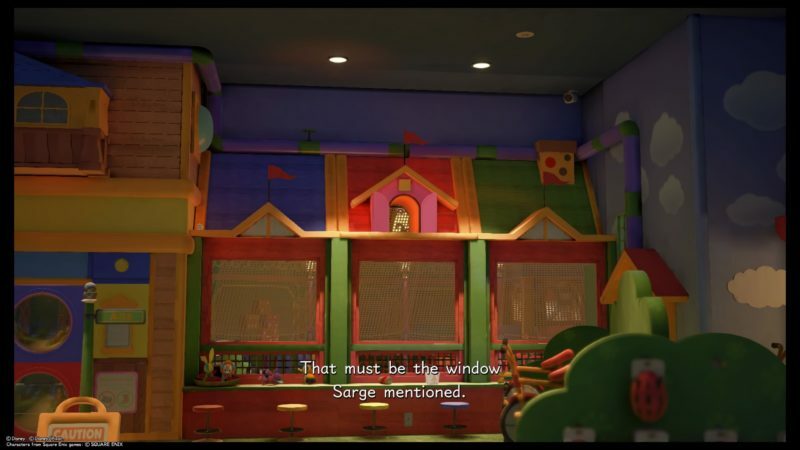 Get to the toy house which is near the window. You can look at the radar in the image below for a clearer picture. 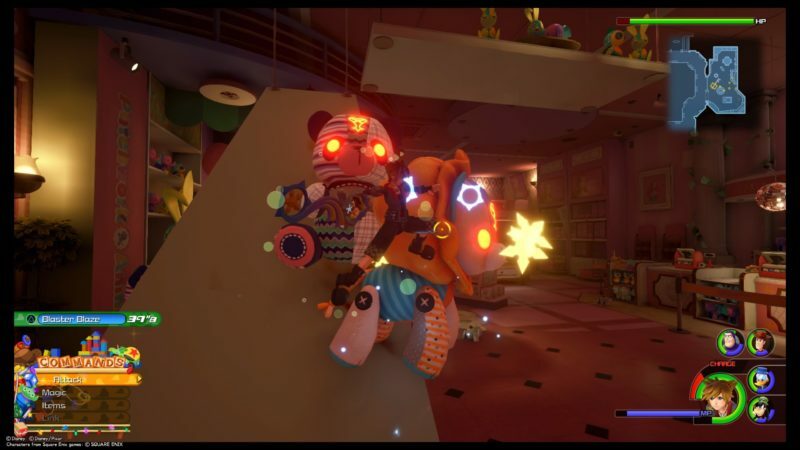 Interact with the toy house and you will find Hamm inside. Hamm was locked in the toy house by a giant doll. 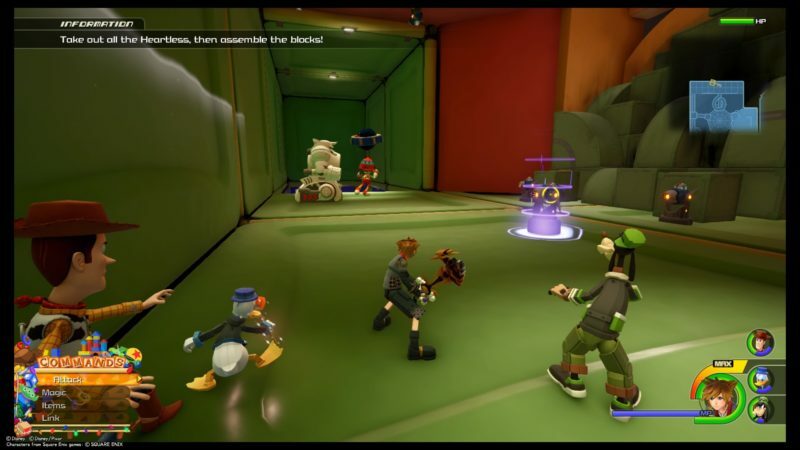 Defeat the doll along with the other Heartless. She’s pretty big and can fly, which makes the fight even harder. 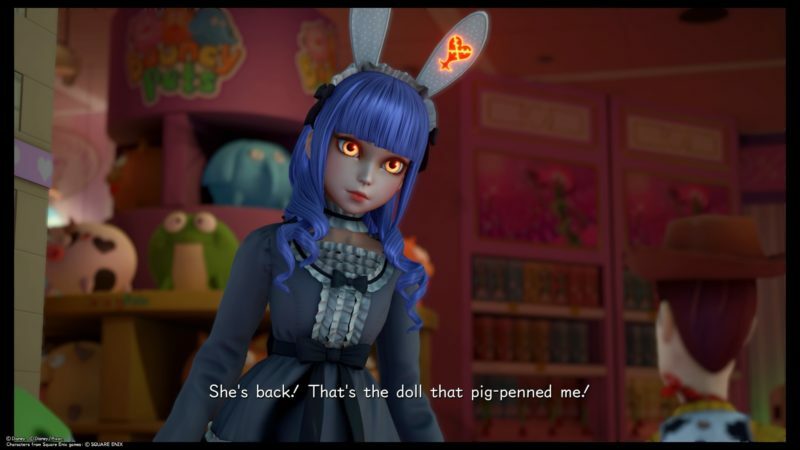 This giant doll also has six health bars, which makes the fight longer. 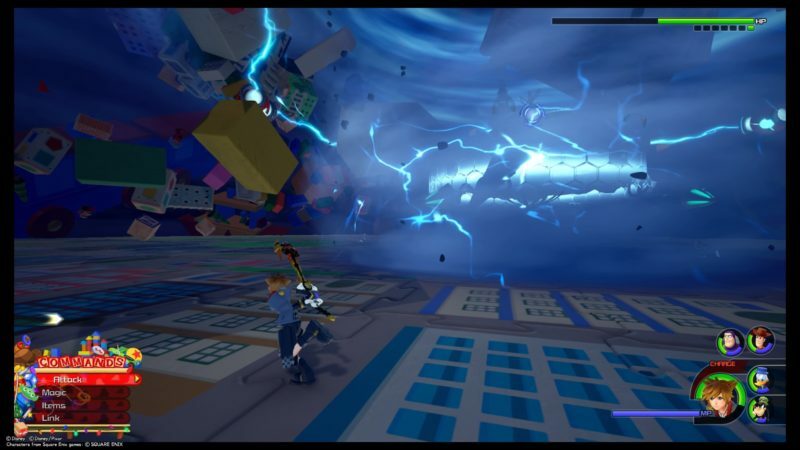 Personally, I almost died, so Sora went into rage mode. The fight ended much quicker then. 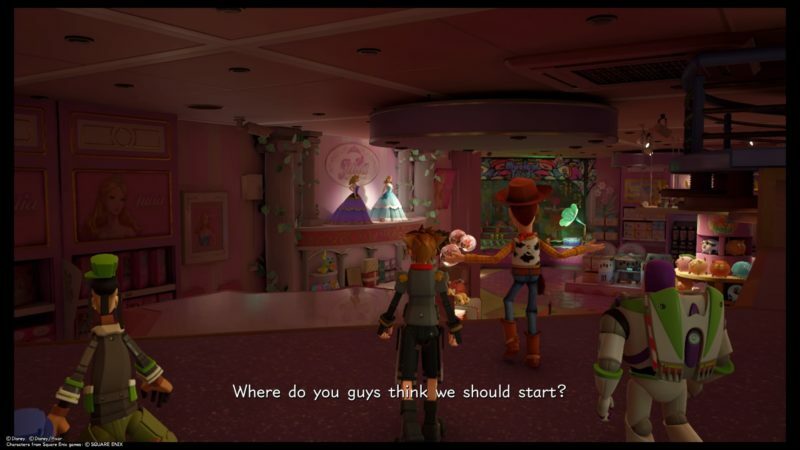 After defeating the doll, you need to look for the three aliens. You will see a UFO taking them away. 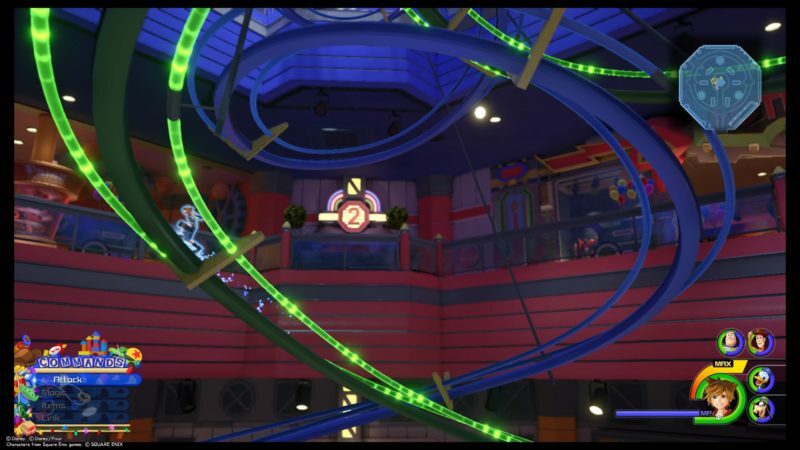 Get to the Play Place on the third floor of Galaxy Toys. 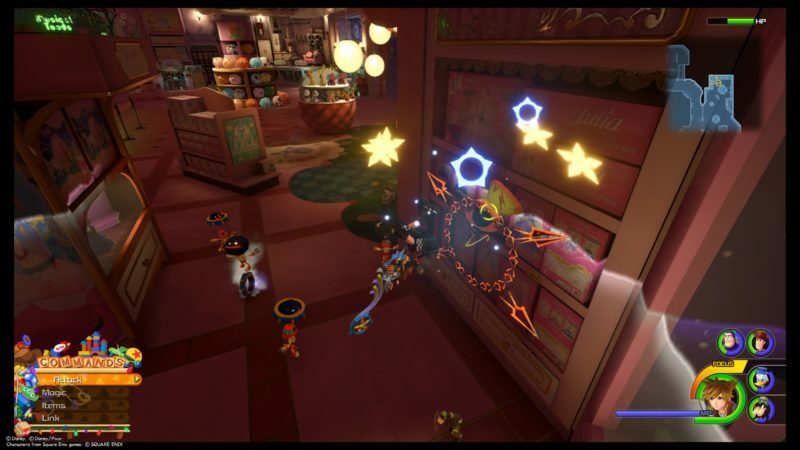 Defeat the UFO and the other Heartless. 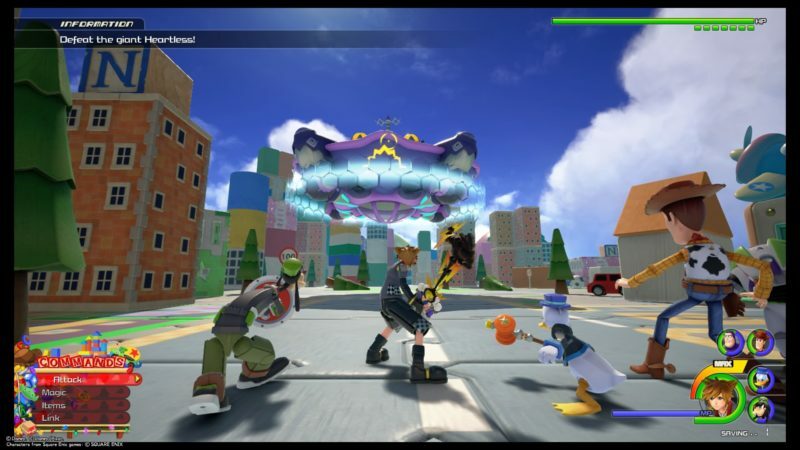 The fight probably ends if you destroy the UFO, so you don’t need to destroy all of the Heartless. This UFO can be quite annoying as it flies away quickly. Try to use some long range attacks with your shotlock. After defeating it, the three aliens are safe again. As everyone seems to be safe, get back to the first floor. You will need to send them off. 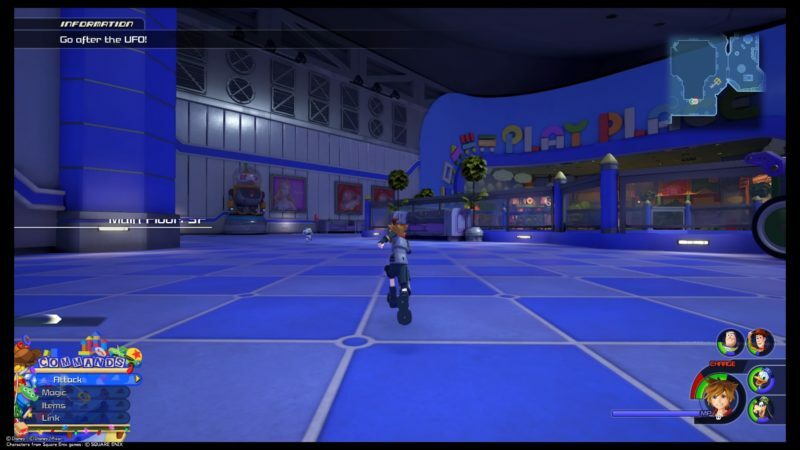 However, Rex disappeared as he went to the video game department in Galaxy Toys. Get to the third floor of the building. 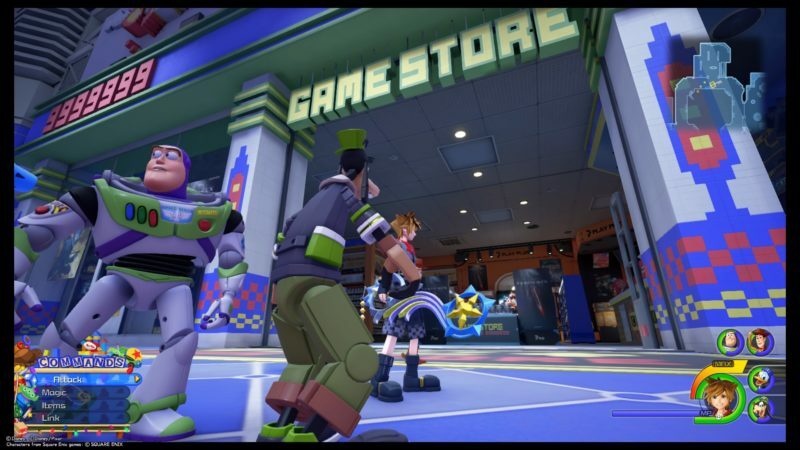 You will see that Game Store is now opened (earlier it was locked). 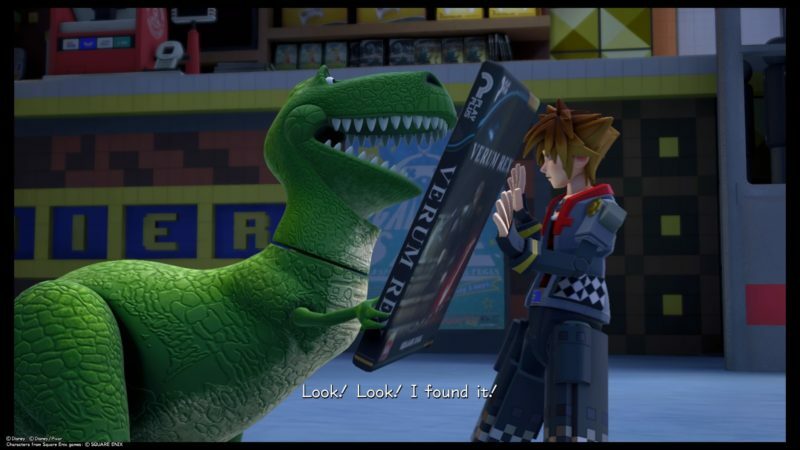 During the cutscene, Rex appears with his favorite video game Verum Rex. 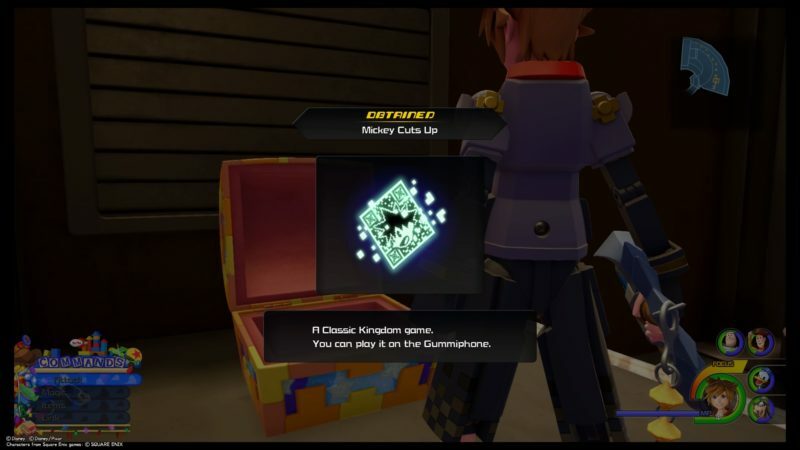 Xehanort appears again, and throws Sora into the video game Verum Rex. 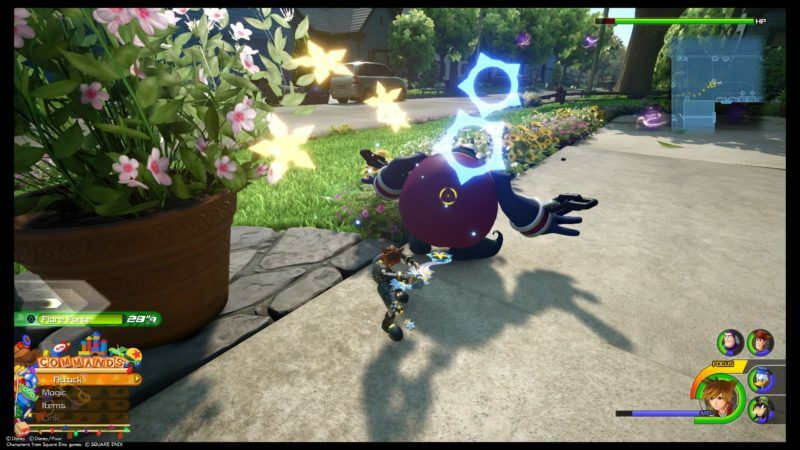 Buzz Lightyear gets possessed by Xehanort. 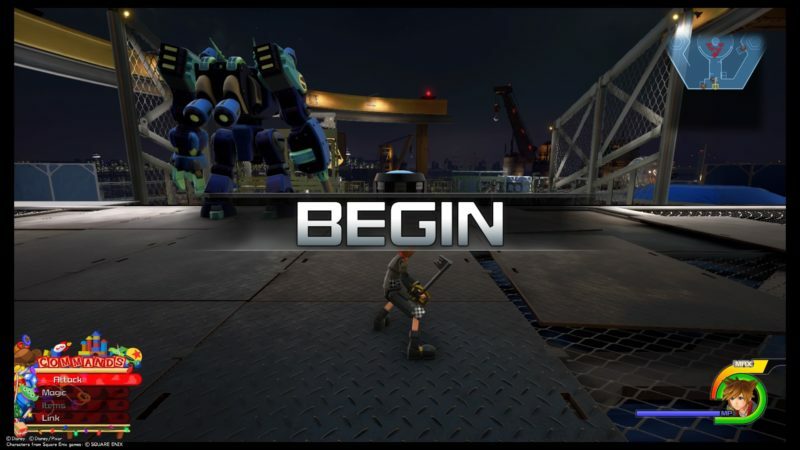 You are now stuck in the game until you defeat the Gigas inside Verum Rex. Use one of the Gigas. 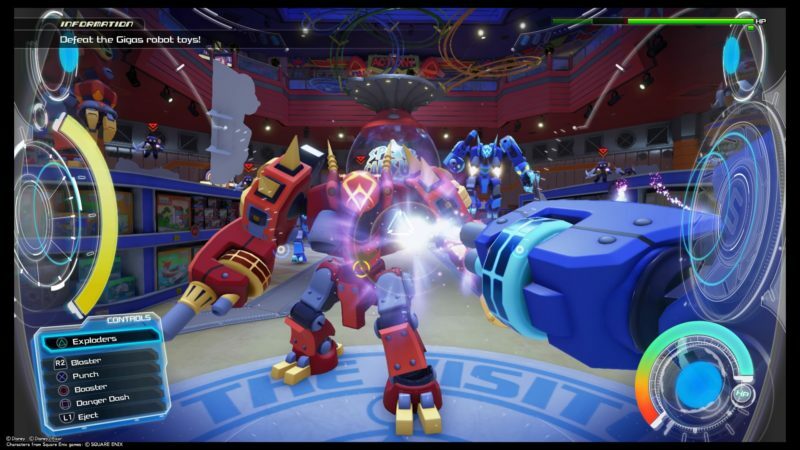 This time, there’ll be more than 20 of these robot toys. Keep destroying all of them. 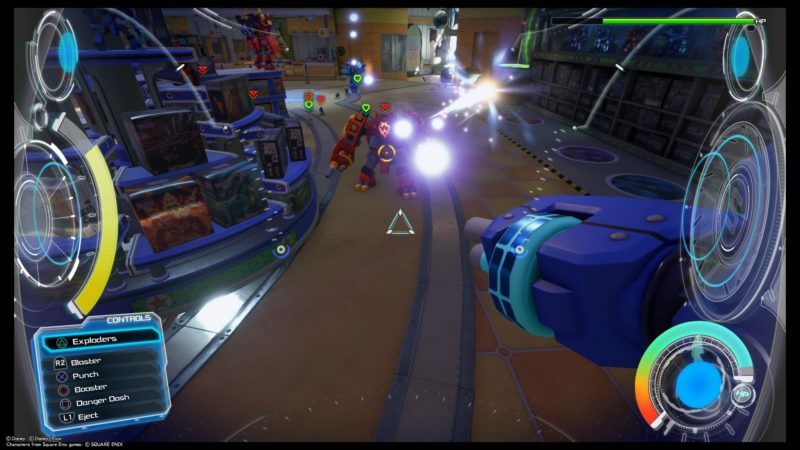 If your robot is dying, eject and choose another robot. You can always use a Gigas once you’ve defeated it and it becomes unoccupied. After some time, an even stronger version of the Gigas will come. It has a much higher HP (several bars) so it takes a lot more to destroy it. 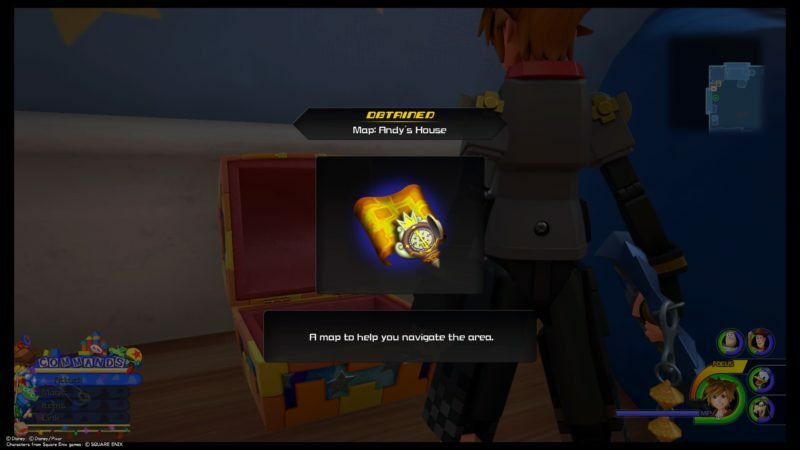 Once you’ve defeated it, you will obtain a Pixel Heartbinder, which is used for Wreck-It Ralph’s link command. 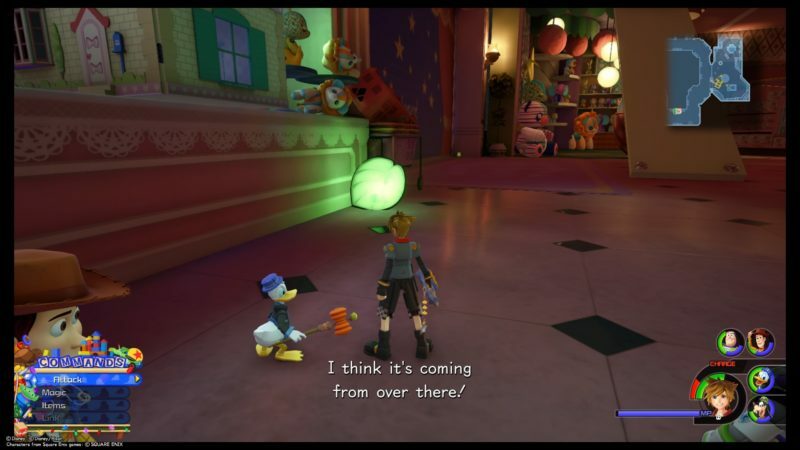 Sora then comes out of the video game. 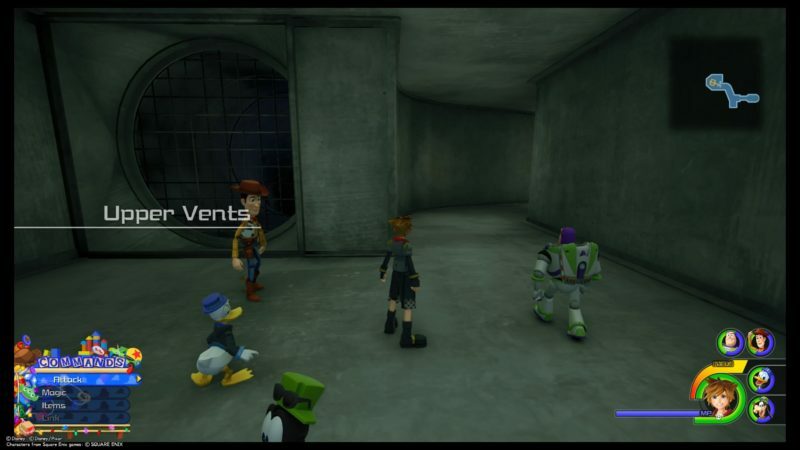 Unfortunately, Buzz Lightyear left and went into the darkness. 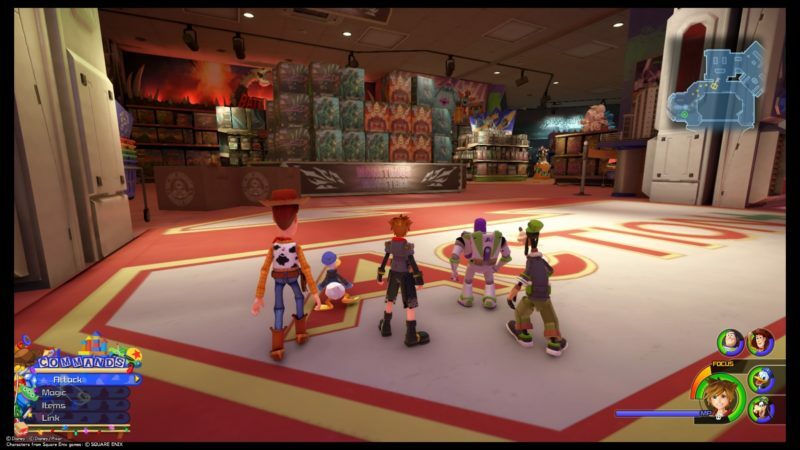 You need to find Buzz, and apparently there’s a place that connects to the darkness. It’s called Kid Korral. 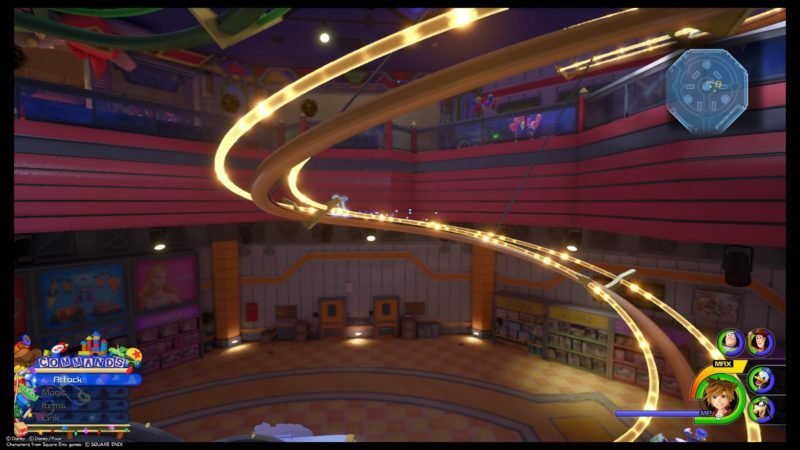 Go to the third floor and find the place called Play Place. It’s the shop opposite of where you found Hamm earlier. You should see a small window in the toy house inside. 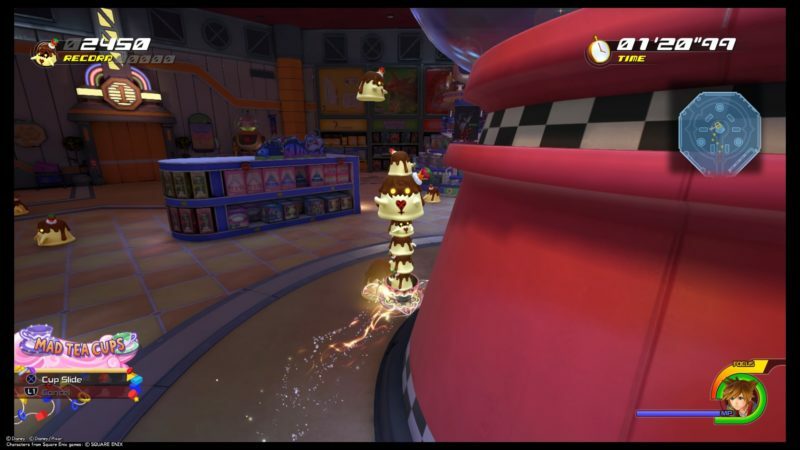 You will face more Heartless here, but you can run away and just get to the top. You are now in Kid Korral. It’s sort of a big playground. The place which leads to the darkness is at the vents, but it’s high up above. There’s also no way to get up unless you can stack boxes all the way up. 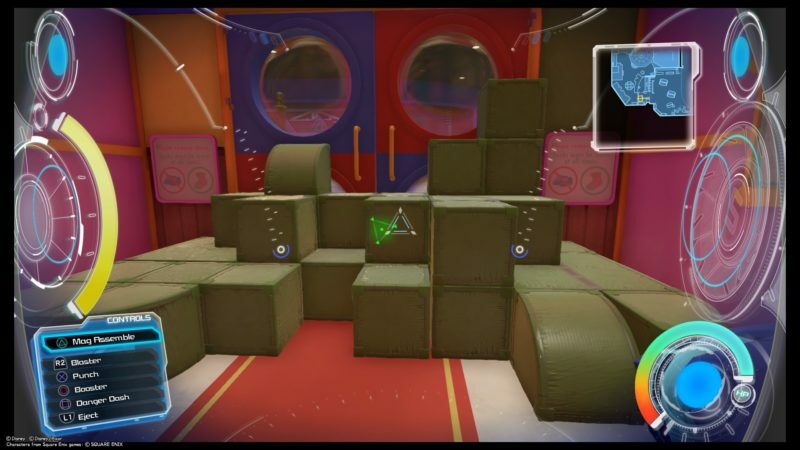 The game should teach you how to stack boxes. Just press “Triangle” near the boxes. Don’t be confused with the other boxes. The relevant ones are greenish in color and are of the same size (mostly). Now, explore the place to find more boxes. 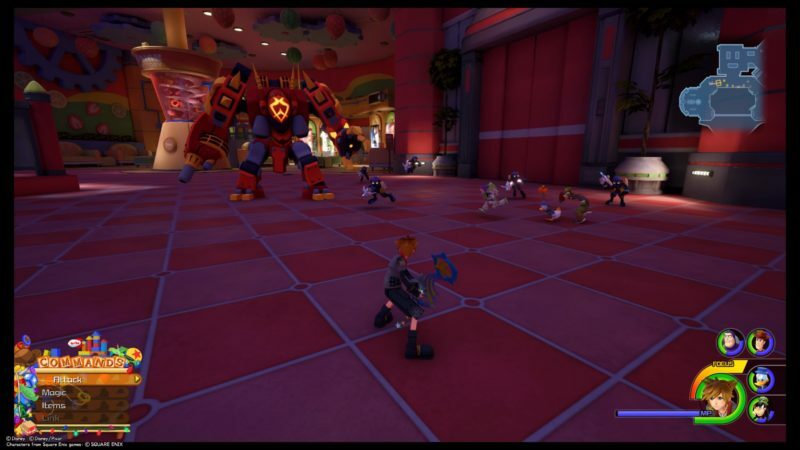 You will have to defeat the Heartless (mostly Gigas) as well. Once you’re done, you should find another stack of green boxes nearby. Do the same thing. 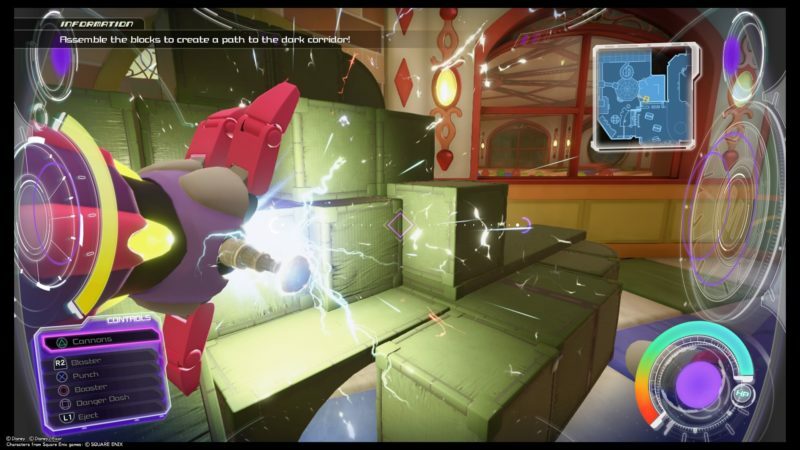 To get to the next stack of boxes, head to the place with many of these dice-looking boxes. Destroy them and it will reveal the actual boxes. 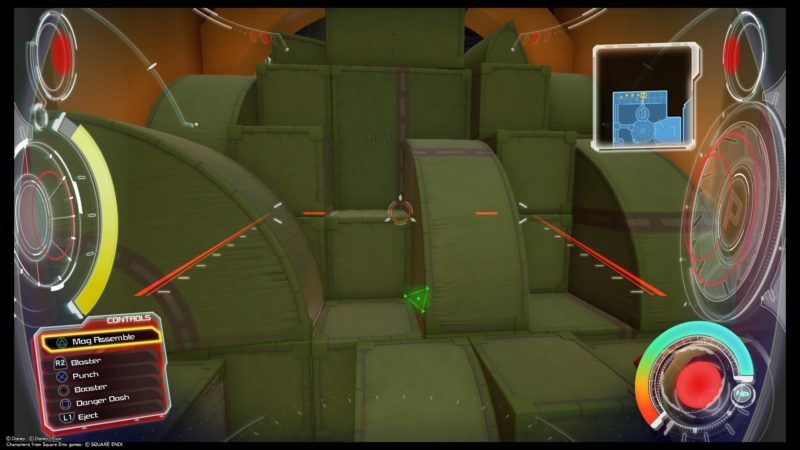 Once again, stack the boxes by pressing “Triangle”. You should be left with only one stack of boxes at this point. Get to the highest point inside the Jungle Gym. It’s the one with rock climbing and other stuff. Find the way up to the highest spot and you’ll see more boxes. Interact with the darkness on the boxes. 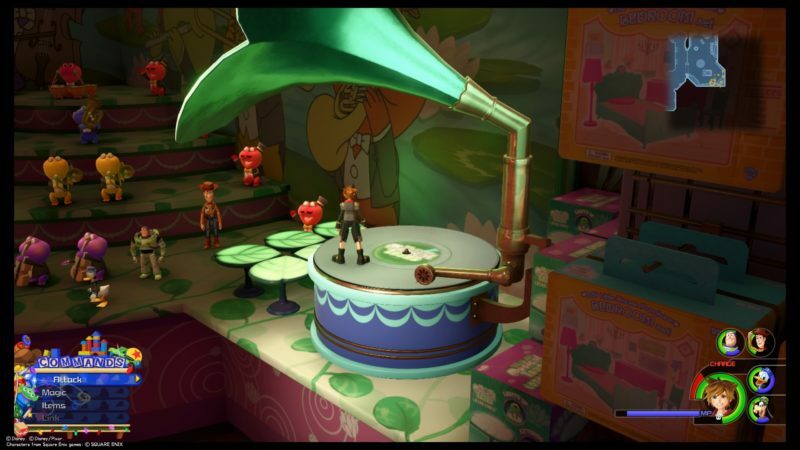 Now, you need to defeat every single Heartless in this place (most floors). Once you’re done, get into a Gigas and fly to the top area. For the last time, stack the boxes. 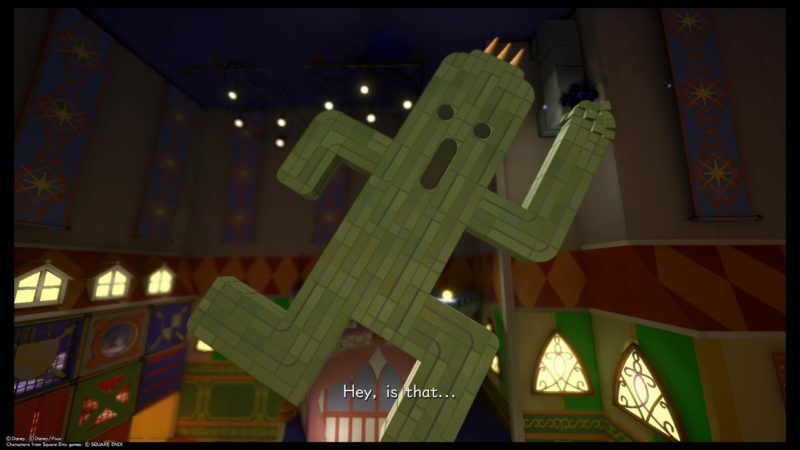 The boxes will be in the shape of a Cactuar from Final Fantasy. You can now climb the structure up to the vents. 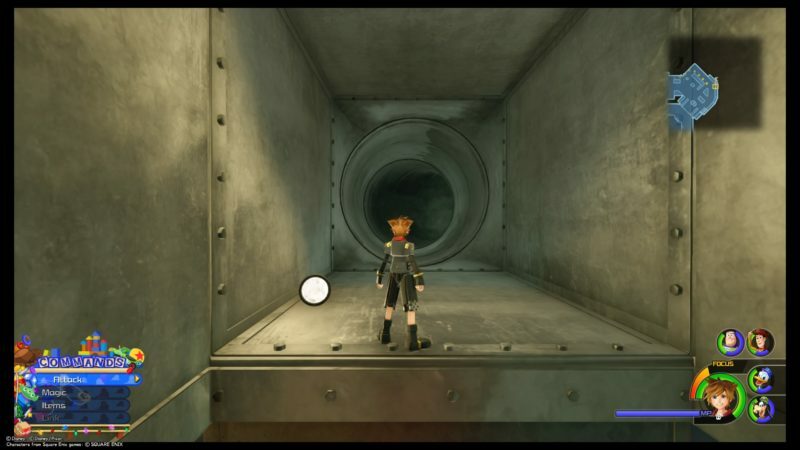 Once you’ve reached the vents, you should see a darkness portal. 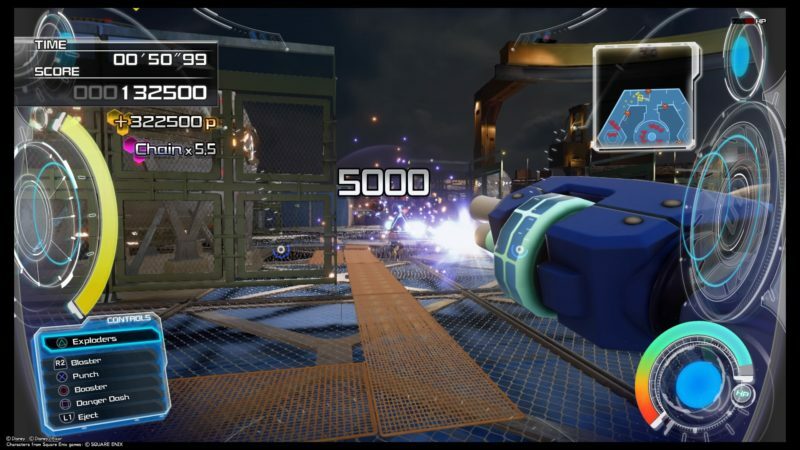 You may want to save first as a boss fight is coming. Get into the portal and there’ll be a cutscene. 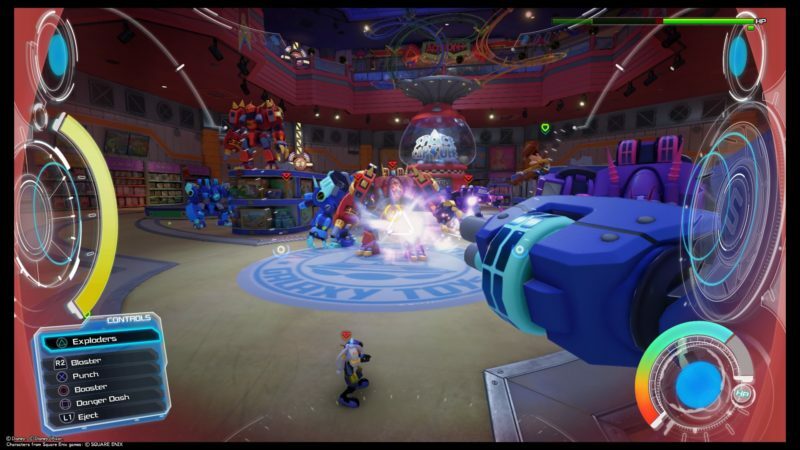 Xehanort is inside with Buzz Lightyear. Woody will rescue Buzz and the latter will come back to the light. 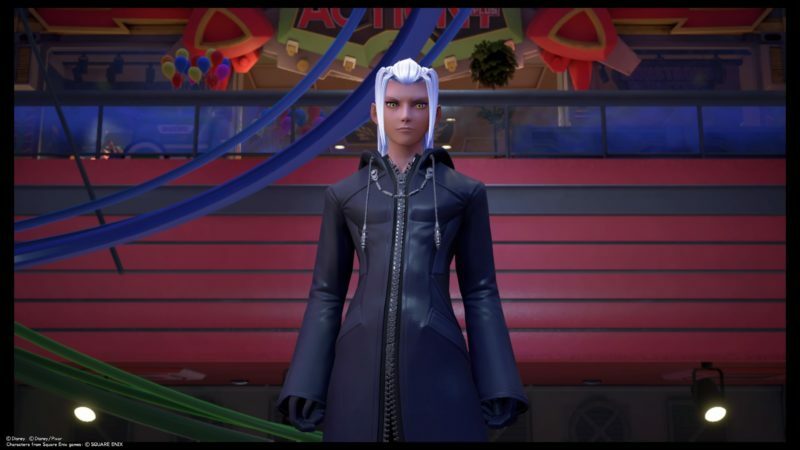 Next, Xehanort left a big present in the form of a giant Heartless. It’s like a big UFO boss. To damage it, you need to jump on top of it. Keep hitting its head to lower the HP quickly. This final boss has eight health bars, which is insane. The hard part is when it creates a tornado. Luckily, you can dodge the tornado when it comes towards you if your timing is right. Keep dodging and it will go back to its original form. Now, continue hitting it on its head. 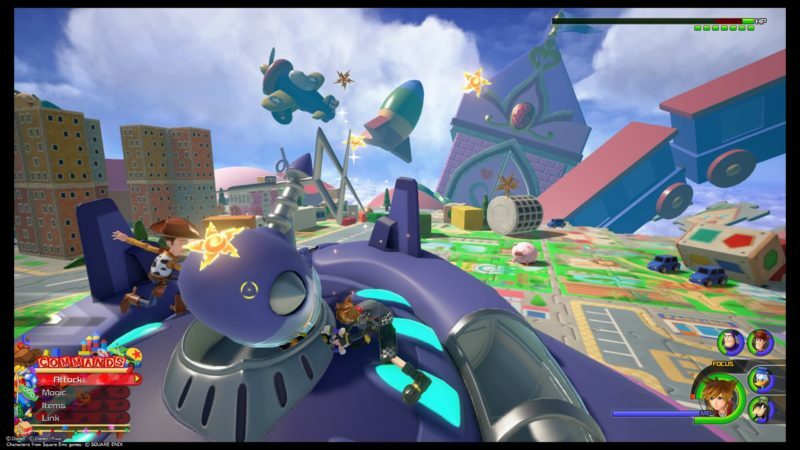 If it hovers too high, you may be able to climb some buildings and jump on the UFO. This world completes after this final boss. 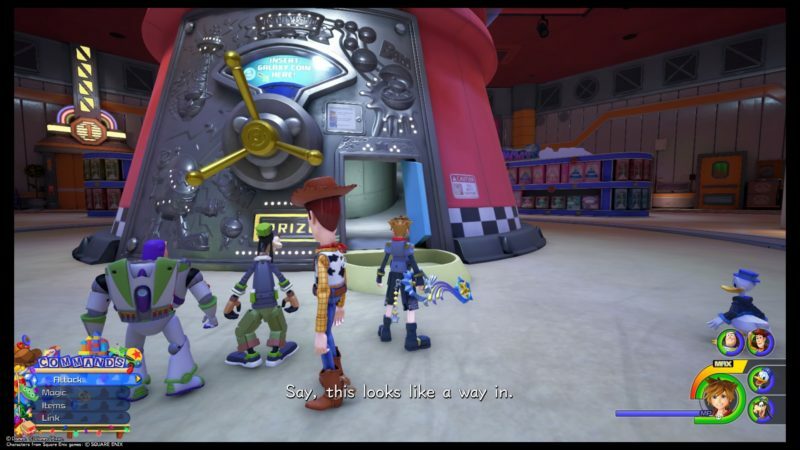 You will get a new keyblade – Favorite Deputy. It emphasizes on strength skills. And that’s about it. 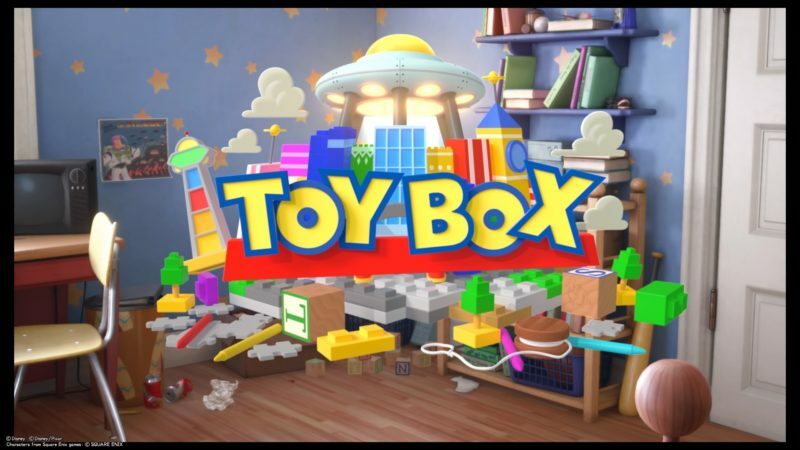 Hopefully this walkthrough and guide on Toy Box is helpful for you.